This oil painting measures 40 x 50 inches and still has a ways to go. Sadly the woman who commissioned it passed away, and I never received a deposit. As a result, it’s been on the back burner for a few years, but I’m getting anxious to finally finish it. 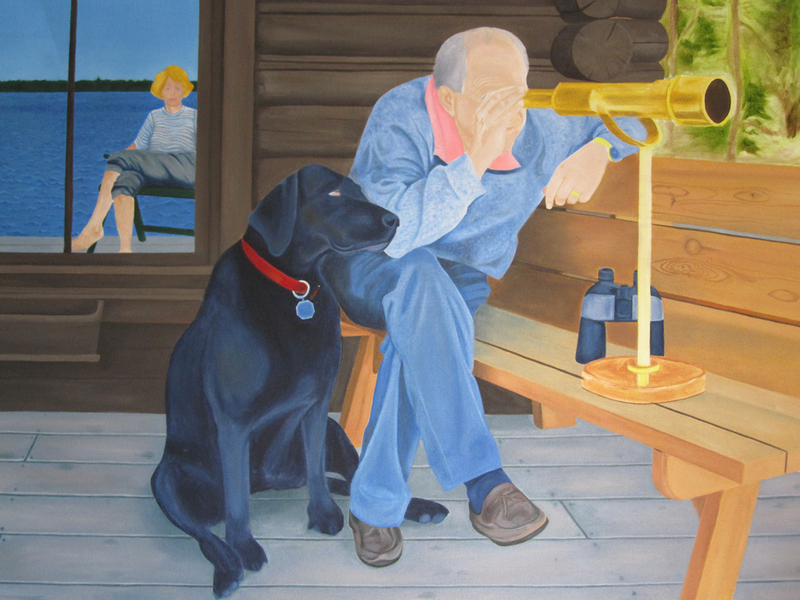 The painting is from a photograph that she took of her husband, and it is her reflection in the window of the cottage. However, I eliminated the camera and painted her sitting and staring straight ahead at the viewer. The dog was quite a challenge because he had an odd way of sitting and was completely black in all the photos. I could not see any details of muscle definition or bone structure, so I went to the library to do some research on Labradors and dog anatomy. On the technical side, I built the stretcher myself from scratch, and used heavy canvas as the support. Something I didn’t realize until it was too late was that the extreme roughness of the canvas didn’t allow for the buttery flow of paint that I was used to on finer canvases. It’s not a bad thing in and of itself, but the texture of the surface affects how the paint is handled and the degree of smooth detail that can be achieved. Stay tuned for upcoming progress reports as I tackle this project. Michelle, so sorry it took so long to contact you re this great work.! The famiky is still in discussion but I want to let you know that I want you to persue the work. Please give me your email address and phone number where I can reach you to discuss the financial arrangements.